My World: Fall. Rise. Grow. It was year 2010. I was enjoying being involved in a robotics company; working part time for them. Being called the Robotics guy in my circle was the best thing that could happen to me. I was winning several paper presentations, a new kind of high had gripped me. It was beyond ordinary. But life had a completely different story etched for me. It was not so nice. The summer of 2010 was the worst one for me. It was the time I faced a huge blow academically. I failed. Lost an year in college. The world had come tumbling down for me. I was hit to the core, broken, depressed, all bad stuff. I was at the rock bottom of my self-esteem covered in guilt and negativity. At one instance I was driving back home and in those very depressed thoughts, I had a head on collision with a car on a red light. That accident shook me; luckily I escaped unhurt, crying, and it helped me get my mind straight. One big bump later I came to realize the fact that the world wasn’t over. There is still hope, and there is a light at the end of this dark tunnel. That incident gave me a direction in life — UP! I knew I didn’t want to be called a failure; so I didn’t act like one. We all fall in such instances where there is a bleak ray of hope, where it all seems meaningless. It truly depends which way you face that failure. Do you curl yourself in a shell or do you face it with a brave heart? The worst of all times will come, but the trees which survive storms are the ones which survive. 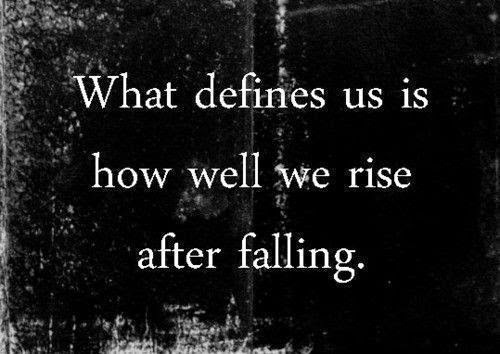 So, next time you hit rock bottom, stand up, face that damn thing, Rise. That is when you will grow in life; truly. Until next time; I’m Batman.